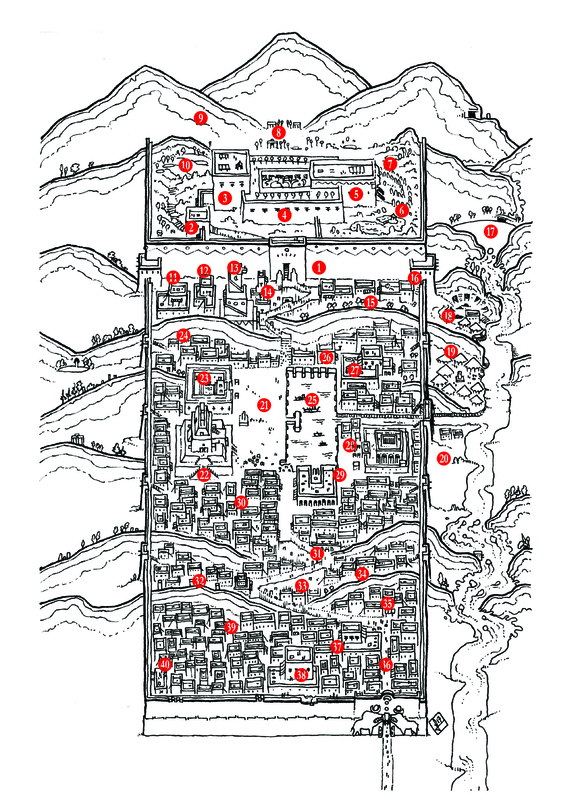 Eshnunna is a large city, housing nearly a thousand inhabitants behind its thick walls. Apart from the Great wall, two things are visible from a distance: the white temple (22) than any other building in the city and the brightly colored tarps of the large bazaar and the salt market (19) by the riverbank. Eshnunna lies on the slopes of mount Itut, with the broad and cold river Diyalat running past it. The climate of Eshnunna is rather inhospitable, with occasional sandstorms blowing up from the south in the summer and blizzards in the winter as well as heavy rainfall all seasons. Eshnunna is famous for its malachite mines (18) and a large salt market. Besides from producing malachite, most people are farmers or herders. The most common livestock is goats; the most common produce is grains. To the people of Eshnunna, clamshells are valued more than electrum and Lapis Lazuli. The most prized shells are those of the purple clam. Young men and women risk their lives harvesting small shells from bottom of the icy Diyalat, whereas prosperous merchants and nobles trade purple clamshells from the swampy Agam delta that are richer with shellfish. The less fortunate collect common shells and dye them to imitate the splendor of the wealthy. Most people have one or more imitating thrushes caged at their houses. The birds are believed to ward off disease and evil magic as their speech supposedly makes evil spirits confuse them with the inhabitants of the house. Thus, all misfortunes aimed at the residents will instead be bestowed on their birds. The nobles of Eshnunna are easily recognized, for their skin is of a darker hue and they wear multiple layers of clothes and ornate headdresses. The vain tries to mimic the fashion of the nobles, even using rare powders to tan their skin. There are two principal local deities: Tishpak (28), the four-faceted god of old and Amsur (7), the young and powerful bull god. Amsur is larger than any ordinary ox and his skin gleams like gold and copper when reflecting the sun. He resides in a secluded garden (1) behind a massive wall and a white temple erected to his glory. Once a year, the city gates are barricaded and the bronze gates to the secluded garden are opened for the festival of the ox. During the festivities, people light bonfires in the streets; yelling and beating drums and hollow logs to lure Amsur out of his lair. If, after a full night and a full day the beast hasn’t come out, great misfortunes will befall the city in the coming year. If, however the bull charges out, the bravest people try to touch it without being trampled or horned to death. Anyone surviving the touch of the bull will be dressed in silk and appointed counselor in the arcade of nobles (29) for the remainder of the year. Once the bonfires burn out, people hide silently in their homes waiting for the great bull to return to his garden once again. Then, the court of haruspices (8) assembles to foretell the future of the city, based on the celestial signs and the actions of the bull god. Head of the court of haruspices is the priest-queen Shimut (3), ruling Eshnunna by the powers of the bull god. She resides in the white temple by the secluded garden of Amsur, reading the stars and the hearts of mortal with the same ease. The priest-queen is feared for her might and revered for her nearness to the great bull. As insignias of her exalted power, she wears a horned helmet and purple garments adorned with white feathers. She is always escorted by a guard of 13 albino eunuchs (23). Known only to a few, Shimut’s power over the great bull is actually as limited as everyone else’s. Instead, she relies on the enslaved herder Ilinna (6) to control the beast and force it to seemingly do the priest-queen’s biddings. Her imprisonment has made Ilinna resentful, and she plots in secret to overthrow the queen and take her place as the rightful champion of the bull. Shimuts chief rival is the council of nobles, and the vizier Degul Rhur (27) who has risen to power and prominence using a seemingly endless wealth. Degul grows bolder (and wealthier, they say) by the day, and challenging the rule of Shimut and her god the Bull and advocating the restoration of the Tishpak cult. 1. The garden of Amsur is protected by a thick wall, the height of five mortals. Just north of the square of sorrows, large bronze gates gleam in the sun or glitter in the moonlight. Once every year, they are opened to let the bull god loose. How they operate is a secret, known only to the priest-queen and her eunuchs. Every dawn, people arrive at the gates to leave offerings to the bull god, in hope he will have mercy on them and alleviate their sufferings. When venturing outside the palace Shimut is always accompanied by her eunuchs, loyal to death by a powerful enchantment. 6. Hidden in the dense woods and next to a dark pond, lies the shack of the herder. The herder is a prisoner of the temple. Once the Great Bull was found in her herd, the Priest-queen of Eshnunna sealed her in the temple gardens so she would not contest her power. Ilinna has spent nearly her entire life in the confines of the beautiful valley, never laying eyes on the outside world. With age, she has grown bitter and resentful up to the point where she has started to hate Amsur, the animal who is her only companion; the reason for her exaltation as well as her imprisonment. Ilinna, the herder: pwr 2, save 10, end 10. Wearing a white robe of simple design and armed with a herder’s staff (dmg 1d6; the wielder of the staff may force the bull to obey a simple command once (always for Ilinna); 2000 s). 7. Behind the palace, a seldom used flight of steps leads down to the lower garden where Amsur resides. Amsur is a bull the size of an elephant, with skin that gleams of bronze and gold. He is maddened by noise and drawn by fire, and cannot speak any common tongue. However, he can obey direct commands from his mistress Ilinna. Amsur, the Giant Bull: pwr 5, save 5, end 60. Gleaming hide (armor 8) and spear-like horns (dmg 2d8). Amsur may both move and attack at the same time. Legends has it that Amsur cannot be damaged by fire, instead he seems to thrive of it. The Golden Hide of Amsur: From Amsur’s hide, a potent armor can be made during a night. When making the armor you only get one chance. If you succeed, you make a full set of armor for one person. The rest of the hide is useless, damaged or too hard to work. The armor (armor 8; wt 8; 1200 s) renders its bearer immune to fire. 8. A circle of pink stones, erect by the first inhabitants of the lands. Here, the haruspices’ court is held whenever assembled. Roll a 1d6: on a 4-5 one sky-watcher sits here contemplating; on a 6, there’s some sort of meeting. 9. Framing the garden to the west, north and east is Mount Itut. 13. Rising above the temple servants’ quarters is the tall haruspex tower from where the royal bird-watchers observe the omens of the sky. A secret passage and a hundred hidden steps lead to the watch tower (2) of the temple garden. 15. Vendors, selling rare birds, salt and flowers for offerings at the gate of the secluded garden. 17. A dark lake. No-one knows how deep it is. On the western shore, there is a large wetland covered in reed. 19. In the salt market, hidden from inhospitable and fickle weathers under large canvases, salt in any color, shape and taste is traded together with gems and minerals found in the mountains. Problems with the caravan route is threatening the traders of Eshnunna with ruin. Currently, some of the merchants keep closed since they have nothing to sell whereas others are overstocked and desperate for customers. Nonetheless, many vendors are more concerned yet about another problem. It appears that the nearby prosperous malachite mine has ceased to deliver, and rumors abound of death, monsters and superstition. 20. The malachite traders’ encampment are a few mud-brick huts of southern design, decorated with bulls’ horns as well as emblems of other deities. 21. The square of sorrows. 22. The White temple is a tall blackish-brown step pyramid with a white marble temple at the top. From the square, 400 steps lead up to the shining temple. At nightfall, the rays of the setting sun color the temple blood red. At the end of each month, large and ecstatic masses are held throughout the night as the priestesses read blessings and curses in the stars. 23. The temple guards’ quarters, where the albino eunuchs protecting the priest-queen lives in luxury and decadence together with their handsome and towering leader Pashmur. The eunuchs spend their days feasting on rare meals, frolicking in the steam bath and practicing combat. They are all obese and eerily pale, gleaming from fragrant oils and rose water. In combat they are fearless and strangely brutal, stopping at nothing to protect their mistress the priest queen. Albino eunuchs (12): pwr 3 (+Might –Lore), save 7, end 15. Clad in fine translucent silk, with manicured hands and beautiful make up, armed with tall axes (dmg 1d10, 2-handed). Pashmur, their leader: pwr 4 (+Vigor), save 6, end 18. Wearing an ornate leather war-frock (armor 6, 50% salvageable) and armed with a silver scimitar (dmg 1d8+1, 50 s). 24. The laymen’s quarters, where masons, carpenters and slaves in the temple’s service lives. 27. The abode of Deagul is a large house made from white stone. The house is always guarded by a deputy and five mercenaries. At late nights, Deagul can be seen sneaking out of his house and into the temple of Tishpak together with some servants. Guards: pwr 2, save 6, end 14. Clad in leather skirts (armor 5) and fighting with wicker shields (def 2) and broad axes (dmg 1d8). Deputy: pwr 3, save 8, end 15. Wearing a well-made but battle worn bronze hauberk (armor 6). Armed with a tall axe (dmg 1d10; 2-handed) and a bow (dmg 1d6; range 2). 28. The temple of Tishpak. A large temple dedicated to the eight-eyed deity Tishpak; lavishly decorated but fallen into disfavor with the commoners, the temple chiefly serves the city’s dusky nobility. Here, the PCs can encounter Ishban the orchardman, a confidant of Ilinna the herder. Behind a statue of Tishpak in his fourth and most hideous state is a secret passage, leading down into the changing room of the underground temple. This passage is always locked; only Deagul and his dead accomplice Agabad possessed the ancient keys that could work the mechanism. Unless the PCs claim to be enacting the will of Shimut, Ishaban will ask them to end her wicked reign promising them an electrum medallion shaped like a horned fish (420 s) for the deed. Ishaban was a simple orchard man whose life changed a year ago, as he was touched by the Bull during the last festival. Since then, he has led a life of opulence and comfort, attending the council of Nobles as advisor and the priest-queen’s special representative. Since the council of nobles is all but powerless and Ishaban has little knowledge of the elite’s affairs he has spent most of the year strolling the temple gardens. It was there he met Ilinna the herder, and learnt of her unjust imprisonment and control over the great bull. And it was there he vowed unto her that he should seek to vindicate her, reciprocating the misdeed she had suffered. As the festival is again drawing near, Ishaban has yet to fulfil this vow. He knows his powers are limited but he has begun to understand that his year of exaltation is coming to its end, and with it his life. This insight has made him increasingly reckless, and he is willing to risk exposure for the slight chance that the PCs might aid him. Ishaban: pwr 2, save 5, end 12. Dressed in the blue and red garments of a prince, unarmed (dmg 1d4). + that counselor Agabad (37) has been missing for several days, and crime is suspected. Neema (38), a demagogue of the nobles – a young woman with two dozen golden rings around her neck – questions the inactivity of Degul Rhur, being one of Agabad’s closest allies, in finding him and punishing the perpetrators. + that there’s unrest among the slaves working the malachite mine. One group, advocated by Neema proposes that the nobles should interfere. Another, dominated by Deagul Rhur, demands letting the traders settle the things themselves, lest their control of the slaves be forever compromised. + that there’s widespread discontent with the priest-queen Shimut’s rule, as neither she nor the god she brought are of the local nobility. 37. In the abode of Agabad lives his widow Arala and their two children, together with Agabads brother Agamun and his family. Arala suspects that her husband is dead, and is anxious to retrieve the cylinder seal of his office. Using this, she could claim his place in the council of nobles and be entitled to a substantial pension. Without it, Agamun would become the new head of the house and she’d be forced to marry him or live in the streets as a beggar. Desperate to avoid this fate, she is willing to offer the PCs her remaining wealth of 350 shekels if they were to retrieve the cylinder seal. 38. In the southern part of city is the tower stronghold of Neema. Neema is willing to aid the PCs if they seek to overthrow her rival Deagul, and may even reward them 400 shekels for exclusice knowledge of where his secret hoard is hidden. A longtime member of the council of nobles, she knows that Deaguls wealth and rising influence is recent, but she has no idea as to its source.